Papua New Guinea harbors one of the richest biotas in the world, with approximately 5 percent of the planet’s biodiversity. Yet many areas of the country are incompletely surveyed, especially for invertebrate animals like land snails. Unlike many other countries, Papua New Guinea retains much of its natural forest cover including the largest tracts of intact rainforest in Australasia. This combination of high diversity and low human impact provides unique opportunities to locate and describe biodiversity before significant impact, rather than identifying biota remaining in habitat patches as is unfortunately the case in many other parts of the world. Our surveys of numerous sites throughout Papua New Guinea uncovered approximately 150 snail species that are new to science. 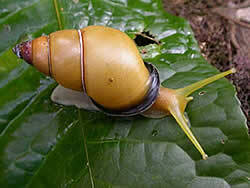 This photo gallery includes some of these, as well as other snail species from Papua New Guinea. New photos will be added periodically, until all known species of terrestrial snails from Papua New Guinea are photographed, most for the first time. Papua New Guinea occupies the eastern half of the island of New Guinea — the world’s largest and highest tropical island — as well as several nearby archipelagos. The country is rugged, with glacier capped mountains that reach 4,500 meters and the deepest caves in the Southern Hemisphere. New Guinea forms the northern edge of the Australian plate and is separated from Australia by the shallow Torres Straits. The two land masses were connected during low sea level stands and share similar animals and plants. New Guinea’s biota is also similar to that of the islands to the north, which are actively colliding with New Guinea. In fact, much of the northern coast of New Guinea is composed of accreted islands that docked as Australia moved north and the Pacific Plate moved west. These accreted terrains probably had unique snail faunas similar to islands offshore of New Guinea today. Papua New Guinea’s high land snail diversity reflects the rugged landscape and many different terrains and islands that make up the country. The New Guinea region comprises three tectonic provinces: SW southwest cratonic zone: C central collisional zone: and NE northeastern islands and ranges constructed by Cainozoic volcanic activity.